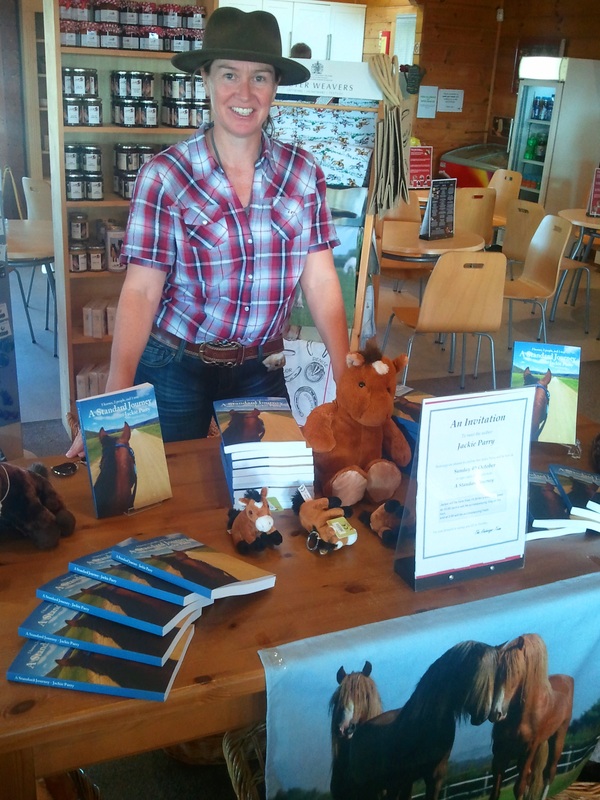 Whirlwind UK Book Tour A Success! And Cake. Two radio interviews, two events, and numerous roast dinners! The past few weeks have been a whirlwind of family and friends catch-up and events for my recent release A Standard Journey – 5 horses, 2 people, and 1 tent. The story is about how we adopted five Standardbred horses, trained them (and they us). The seven of us then set out into the Australian bush for several months; all our belongings carried by horse. 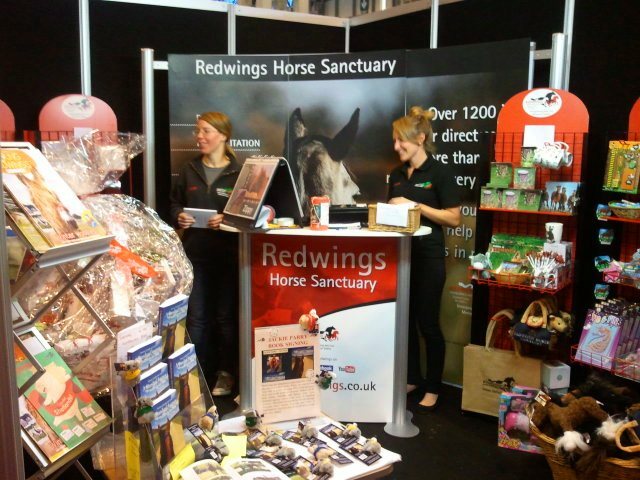 I donate 50%+ profits to horse/animal charities and this led to me a guest appearance at the Redwings Sanctuary at Oxhill and their stand at The Horse Of The Year Show. At Redwings Oxhill, just before the reading/signing. I tried not to reveal the outcome of a dramatic event in the book, but the audience were desperate to know! 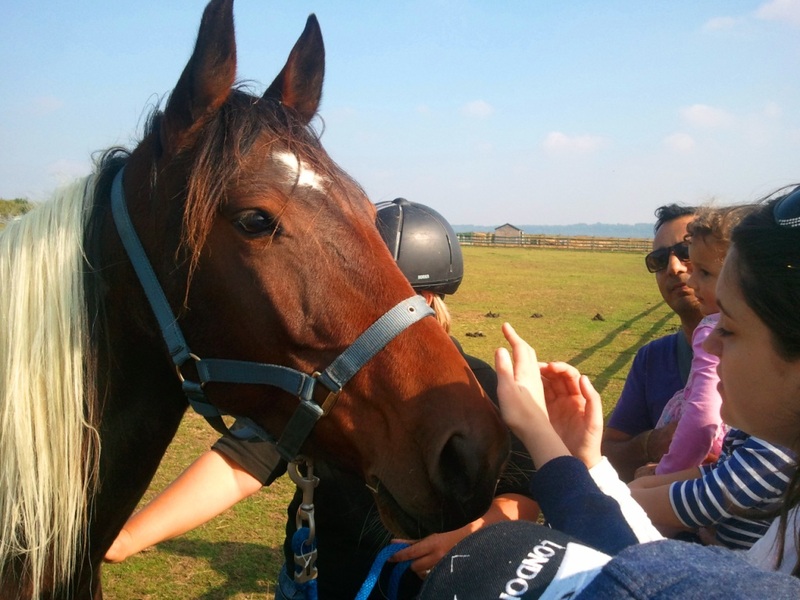 Redwings do a wonderful job – their team at Oxhill are extraordinary in their passion and care. 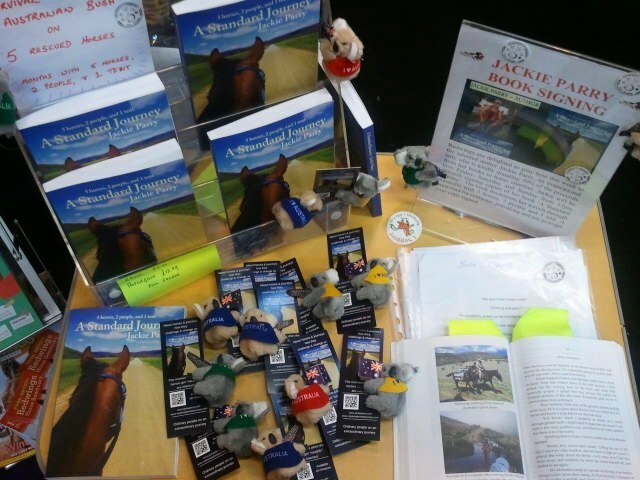 I had a wonderful time at the Horse Of The Year Show connecting with readers and helping Redwings raise money via their merchandise (including A Standard Journey), to help rescue more horses. Redwings Stand and their wonderful team. My books are near the front. They did a lovely job with my table and I added the bookmarks and koalas which went down a treat! Between the mayhem of driving around the country I was invited onto two radio shows (one with Noel). Firstly, with the incredible Carol Graham. Carol is an author, radio talk show host, health coach, motivational speaker, blogger, businesses woman, mum and grandmum! Carol is a wonderful interviewer and here you can hear her easy-listening interviews with extraordinary people. She deftly shares their laughter and inspirational stories, and encourages everyone to never… ever… give up hope. My interview will be appearing shortly – I’ll put the link here and give another shout out when it’s ready! Lastly, we met Nick Coffer from BBC 3Counties Radio. We had great fun chatting to Nick (who thinks we need therapy! ), and left mini koalas hanging all over his studio to make our presence known and remembered. 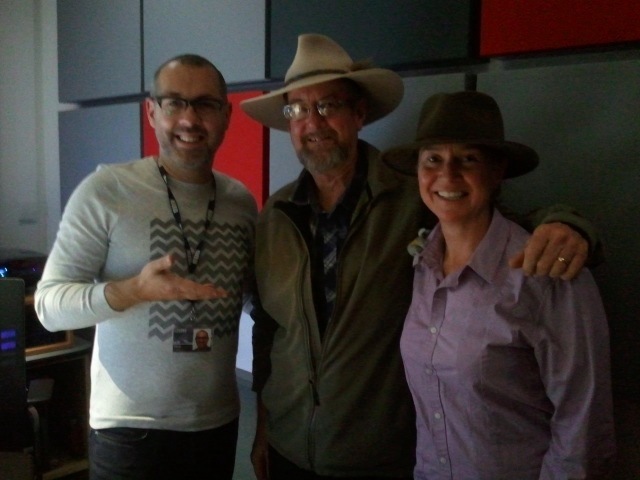 Here’s the link to listen, jump forward to around 37 minutes – the interview runs for about fifteen. Having fun before we went in the studio. With Nick Coffer, having a great time! Several yummy roast dinners, care of my lovely mum, kept me going (and tightened the jeans somewhat). 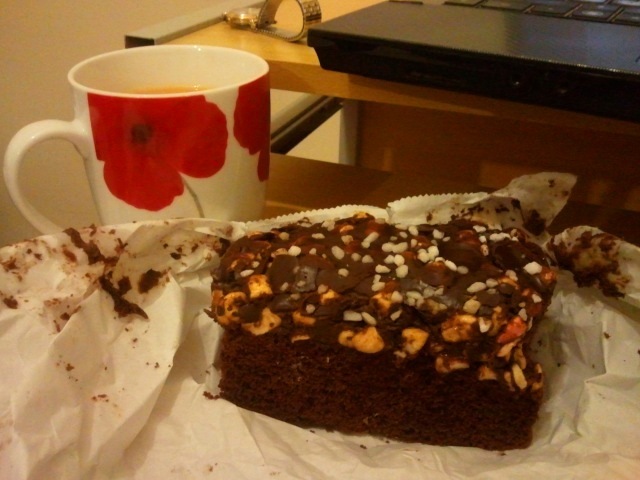 … and CAKE, you’ve got to have CAKE! I learned a great deal from all these events. Switching from social media to ‘getting out there’ has really worked for me, and is so much more fun. I’ll write a blog soon on what I learned and what I’d do differently next time. Has anyone else had great success and fun ‘getting out there’? Categories: Blog, Life's Little Escapades, Writing Woes & Wins | Tags: adopting horses, author, books promotion, charity, charity work, events, helping horses, horse charity, Horses, HOYS, readings, Redwings, rescuing horses, signing, The Horse of the Year Show | Permalink. Thanks Ellen. Yes! Mum’s are wonderful, she certainly helped keep me going! Well done, Jackie and Noel! Another success story, of course. Thanks Rolande, it was such fun. More planned for spring. Horse shows where I rode when I was much younger, it’s like going back in time until I see a mirror and have a sharp reminder! LOL! Having a great time, hope all is well there. Thanks Glen – more cake! Jackie, Congratulations on the book success. You both deserve it. Thanks Mark. The next manuscript is taking shape. 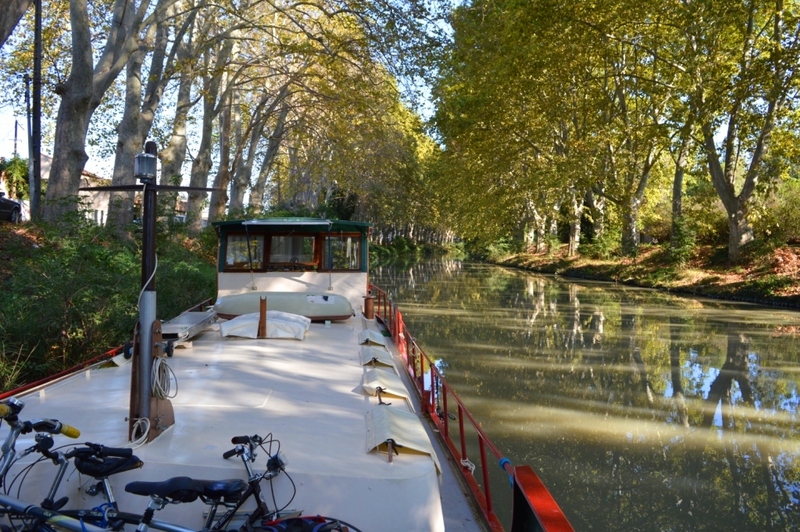 We purchased our second sailboat in America and sailed back via Easter Island, Pitcairn etc. It was a wonderful but tough journey. It’ll be ready sometime next year (I am over setting myself deadlines!). How’s your work progressing? I tend not to write so much during the summer but we are stuck for a week in a storm so I am getting back to it. Wonderful, Jackie. I agree…getting out there is much more fun, but time is a problem and that’s when social media keeps the pot boiling. 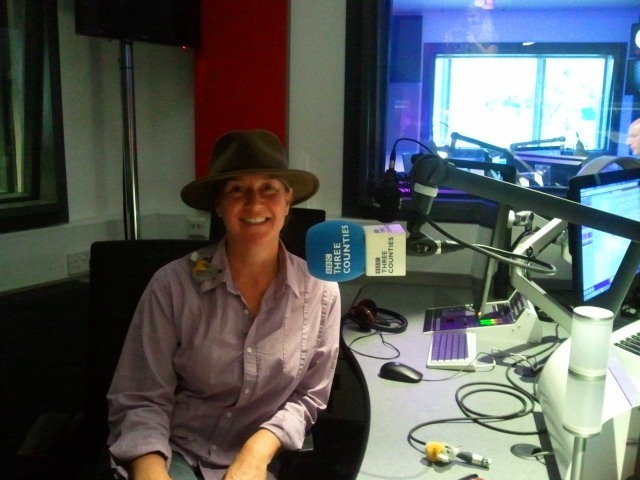 I’ve also just done a radio interview and loved being in the studio. So glad your tour was a success and your mum sounds magic! Thanks Val. Time is the problem. I would love to hear your radio interview. Is it available on line? 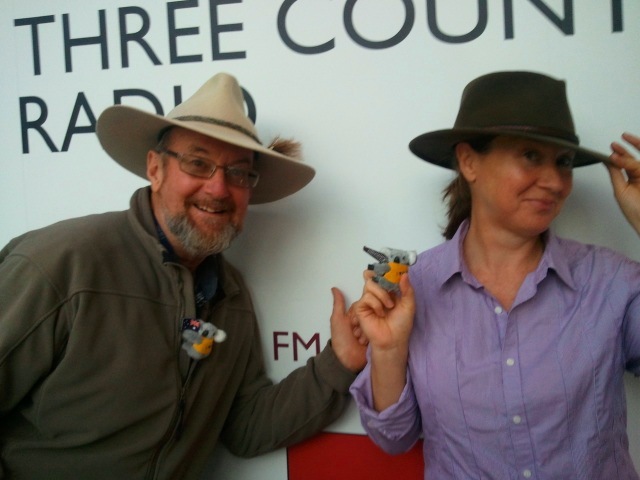 Being in the studio is such fun – we left little koalas every where, so they wouldn’t forget us!